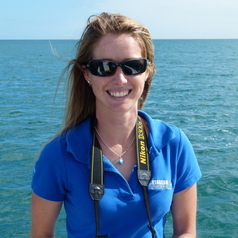 Kate is a Research Associate at Murdoch University Cetacean Research Unit in Perth, Western Australia. Kate studies the behavioural ecology of cetaceans (whales and dolphins). Kate's PhD focused on coastal bottlenose dolphins off southwest Australia, where she examined their home ranges, habitat use and population dynamics.